The autumn sunlight filtered down onto the clay ritual chamber. That light, sometimes known as Rembrandt rays, shone down onto the roof. Tsubakura: "Aaand game over... For a sacred treasure, that was pretty weak." Yaorochi: "Ridiculous...! I can't draw out the sword's power at all..."
Tsubakura: "Maybe you weren't a good enough vessel to wield a sacred treasure?" 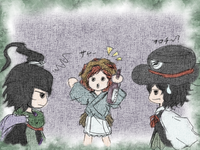 Yaorochi: "Ghh... That can't be...!" At Tsubakura's merciless jab, Yaorochi crumpled to the floor with a big "fllllllllump". At just the same time, someone came running up the ritual chamber's stairs and out onto the roof. Sukune: "Aaaah! There ya are, there! From before! Don't ya go disruptin' the ritual, yanno!" Sukune "Huh? Ya here too, Yaorochi-san? ...But what happened to the ritual? 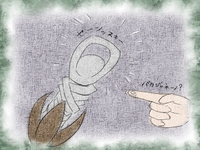 Tsubakura: "..........'Bottle opener'? Well, that's a disturbing sign." Sukune: "Hm? Aah! See, see! There'sh a bottle opener on the handle. It's m'special 'sword-shaped bottle opener'!" Tsubakura: "Oh, you're right... Geeze, snakeface, pay more attention." Yaorochi: "Wha-what... did you... say?" Sukune: "Mm? What about it, nyah?" Tsubakura: "A bottle opener...? Even though it was a sacred treasure..."
Sukune: "What'sh the matter, anyway?" Tsubakura: "That's so unnecessary. Like legs on a snake... as they say." Yaorochi: "....I don't even feel like responding to that." Tsubakura: "Do you need some comfort? I can help, you know." but how about we open up some saké to celebrate?" Sukune: "I've got some good saké over'n that box-lookin' thing in the corner, hoi. Tsubakura: "Uhh. 'Finest-Quality Brew, Yamata-no-Orochi'... pfft." Yaorochi: "...Are you mocking me?" 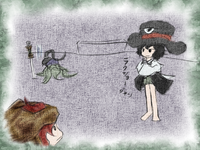 Sukune: "This'll be a day t'commemorate my first finished work! Oh, and leave the bottle-openin' to me." Thus, the imperial treasure's power was transferred to a bottle opener. 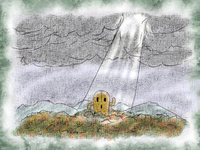 Perhaps for that reason, it was impossible to draw out its true power as a sacred treasure. However, Yaorochi may not have actually cared about that power. It wasn't the sword's "power" that they loved, after all. However, they did still feel rather conflicted about its utility being reduced to opening bottles. Perhaps one might say that Yaorochi's wish was about 70% granted. Despite all that, though, as they held the bottle-opener to their chest, Yaorochi's expression was like none they'd ever made in the past. ...But, doesn't opening saké with an imperial treasure seem a little disgraceful...?